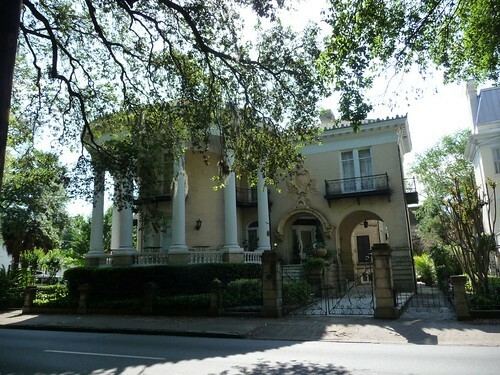 Mali Mish – Day 81: Houses, movies and more food in Savannah. Ava still loves to play with Mila and can not wait for her to start interacting with her more. 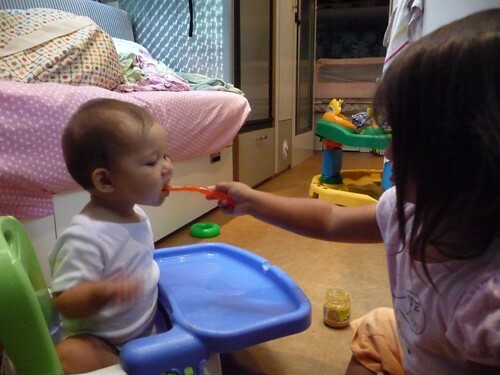 She also loves to help with Mila’s meals now that she is starting to eat baby food. Open wide! We drove into Savannah today as usual just around lunch time. We have been really impressed with the food here and have gotten a few more recommendations from our travel books as well as Internet resources. 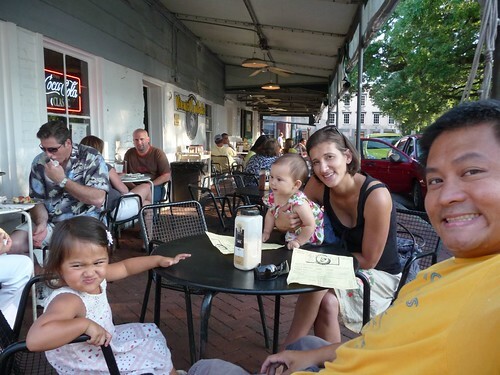 Even though Savannah is not known as a mecca of culinary arts, we can’t get enough of it. 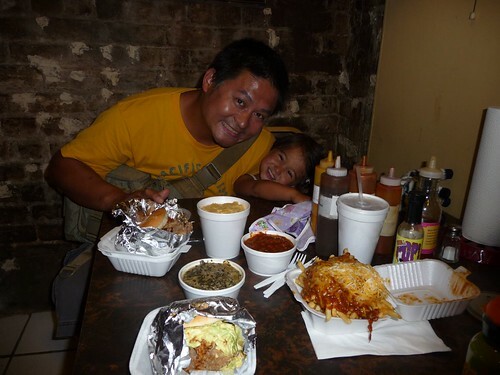 Today we went to a little hole in the wall BBQ place just around the corner from Chippewa Square called Angel’s BBQ. Believe me that the phrase ‘hole in the wall’ is not just a figure of speech. This place only has indoor seating for 6 people and practically no parking. The food was amazing. They are known for the pulled pork sandwiches and its variety of delicious sauces. Take a look at that bowl of French fries. We didn’t come close to eating it all. Being one of the most beautifully old cities in the country, naturally Savannah is a popular location for Hollywood movies. Aside from the Mercer house we toured the other day being the site of the Clint Eastwood movie, Midnight in the Garden of Good and Evil, other movies that were shot here include The Legend of Bagger Vance, Glory and of course the one everyone knows, Forrest Gump. 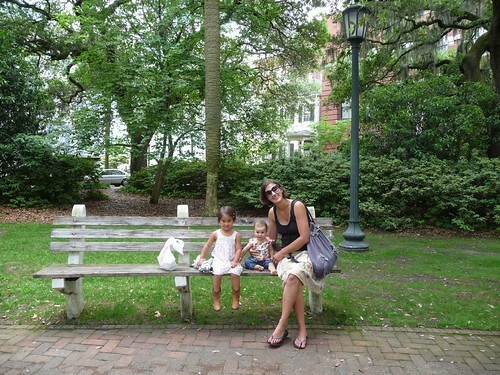 The girls posed for a photo here in Chippewa Square on one of the many benches. Not the actual one Forrest Gump told his life story but one of the many in the city that prop bench was modeled after. Why are we at Target you asked? Well, after Chippewa Square, we realized we forgot to clear our memory card out of the camera last night so we headed there for one as well as some other supplies we needed anyways. Here’s Marlene unwillingly posing for a picture to make sure the card we got works in our camera. Check. 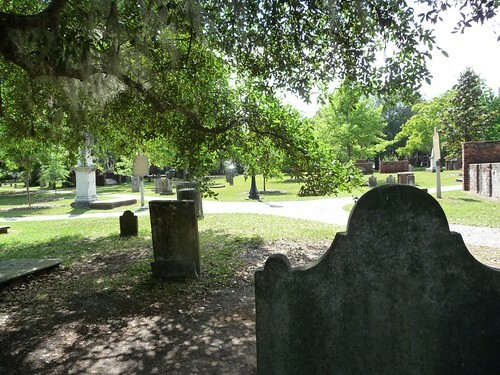 When we got back to Savannah, we stopped at the city cemetery where some of the cities most notable tombs are located. One of the interesting things in this cemetery is that it was used by the union soldiers during the civil war as a staging spot. Some of those soldiers, to pass the time while they were here, made changes to many of the engravings on the tombstones. If you look for it, you will see a man who was born after his son was born as well as someone who lived to be over 400 years old. Those damn Yankees. 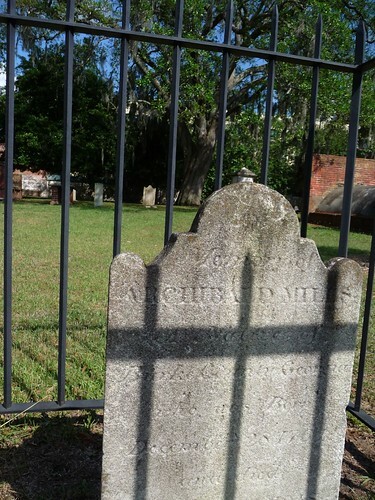 Many headstones are like this one where the years have worn the engraving down to nearly impossible to read the words. It gives some authenticity to the cemetery as compared to some of the other places we went where the headstones have been replaced with new ones. We continued with our tour of the city on our own and Marlene just could not get enough of seeing some of these amazing homes in Savannah. This one right across the street from Forsyth Park we happen to park next was one of the more beautiful ones we’ve seen. 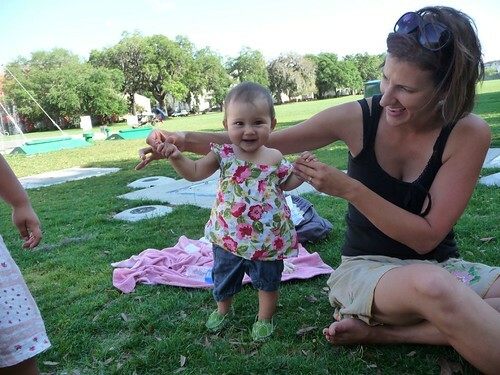 Mila got a chance to take a little break on the lawn of Forsyth Park to try on some shoes for the first time. Ava took her first steps when she was 9 months old so Mila is probably a month of two away from doing that herself. With help from mama, she is getting those little legs ready for the big moment. Her big sister Ava could not wait for that moment to happen. 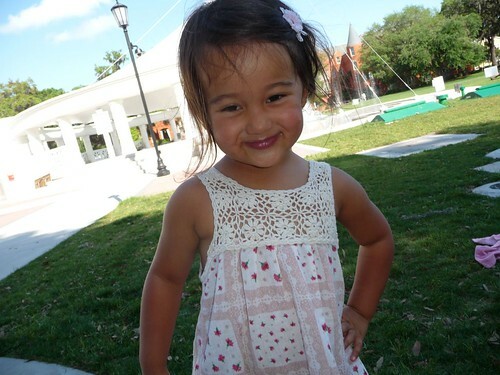 Just imagining having her very own walking talking baby sister makes her all giddy. We headed to the other side of town to check out the recently restored Ellis Square. 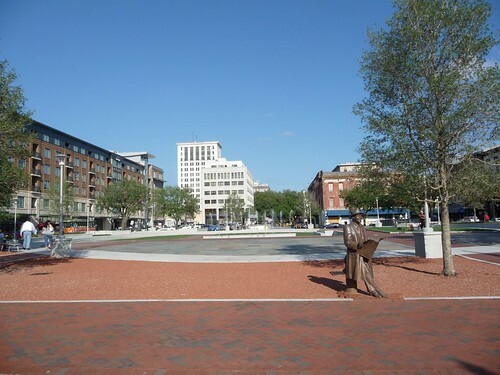 This particular square has gone through a lot of transformations since the original founding of the city. It was one of the original squares but it was at one point a slave market as well as later on the site of a parking structure. Today, the parking has been moved below ground and the space is now again owned by the city as a public space. Doesn’t quite have the nostalgic feeling that the other squares give you but it is good to have it back. 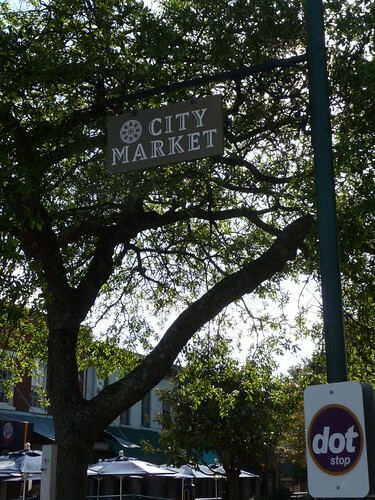 Just next to Ellis Square is the currently location of the city market. The street is closed off to pedestrians only and various restaurants and shops are the current attraction. 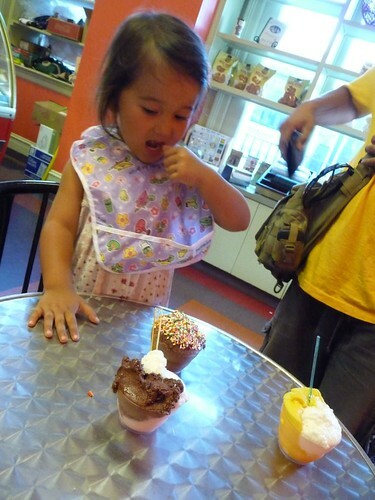 Ava of course was interested in only the ice cream shop. 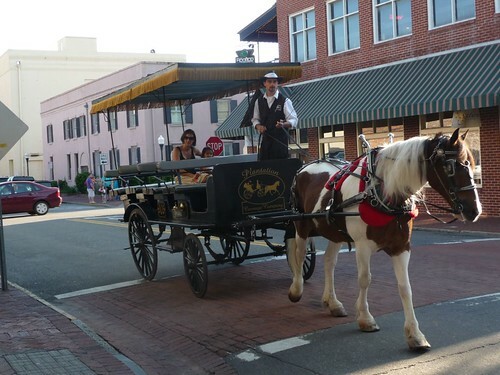 Oh yeah, and also the horse carriage ride. 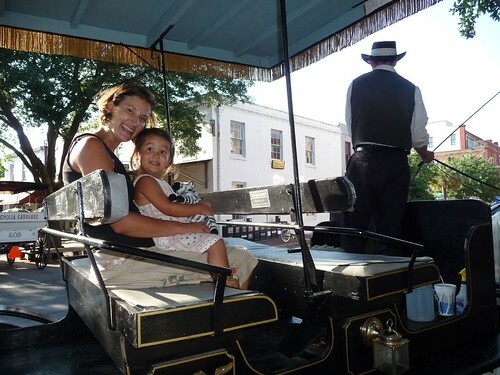 Since it was getting close to dinner time and we did not want to take the long tour around the city, they kindly let Marlene and Ava go on just a quick ride around the block by themselves. I think Ava was hoping for more but today this will have to do. Because we are now hungry again for yet another delicious local dining spot. Vinnie Van Go-Go’s Pizzeria. If you like pizza, you will not be disappointed. Day 80: Forget Paula Deen, go to Mrs. Wilkes.